(CNN) -- Americans Elinor Ostrom and Oliver Williamson won the Nobel Prize for economics for work on how community institutions can prevent conflict, the Nobel Committee announced Monday. 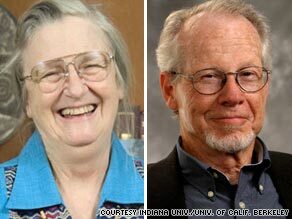 U.S. professors Elinor Ostrom and Oliver Williamson are joint recipients of the Nobel Prize for economics. Ostrom becomes the first woman to win the prize in its 40-year history. The award was a "great surprise... I'm still a little bit in shock," she said by phone at the news conference announcing the prize. The committee highlighted her research on a dam in Nepal as an example, saying her research has moved analysis of nonmarket institutions "from the fringe of economic analysis to the very center." Ostrom said she had not yet thought about what she would do with her half of the $1.4 million prize. Williamson, a professor in the graduate school at the University of California, Berkeley, was cited "for his analysis of economic governance, especially the boundaries of the firm." Williamson's work examines why large corporations tend to arise -- and why they do not -- based on the cost and complexity of transactions, according to the Nobel committee. "He has taught us to regard markets, firms, associations, agencies and even households from the perspective of their contribution to the resolution of conflict," the panel said. Forbes magazine said, "He authored 'The Economic Institutions of Capitalism' in 1975, a landmark text of the 'new institutional economics' movement that challenged the idea of firms as simple profit-making machines. He focused on the contracts and transactions that could explain the structure and boundaries of companies." Williamson did not speak at the announcement ceremony. "At some fundamental level, they are really both addressing the fundamental issue of how we create human cooperation through the design of appropriate institutions," committee member Tore Ellingsen said. "They want to understand nonmarket institutions. ... Both laureates look at such institutions very much as conflict-resolution mechanisms," he said. While the two professors' work has much in common at an "abstract level," their methods are different, Ellingsen said. Ostrom works from case studies to derive general patterns, while Williamson uses theoretical reasoning. The global financial crisis did not affect the committee's deliberations "that much," committee member Beril Holmlund said, noting that Nobel prizes "tend not to be for work done last year." The Nobel Memorial Prize in Economic Sciences was established in 1968 by the Central Bank of Sweden in memory of Alfred Nobel. It is given by the Royal Swedish Academy of Sciences, which since 1901 has been awarding Nobel Prizes for achievements in physics, chemistry, physiology or medicine, literature and for peace. CNN's Jo Shelley contributed to this report.